Update: Winter Storm Warnings Spread Across Northwest : The Two-Way Though forecasters have scaled back from earlier ominous predictions, it's still going to be a mess in much of western Washington State today. 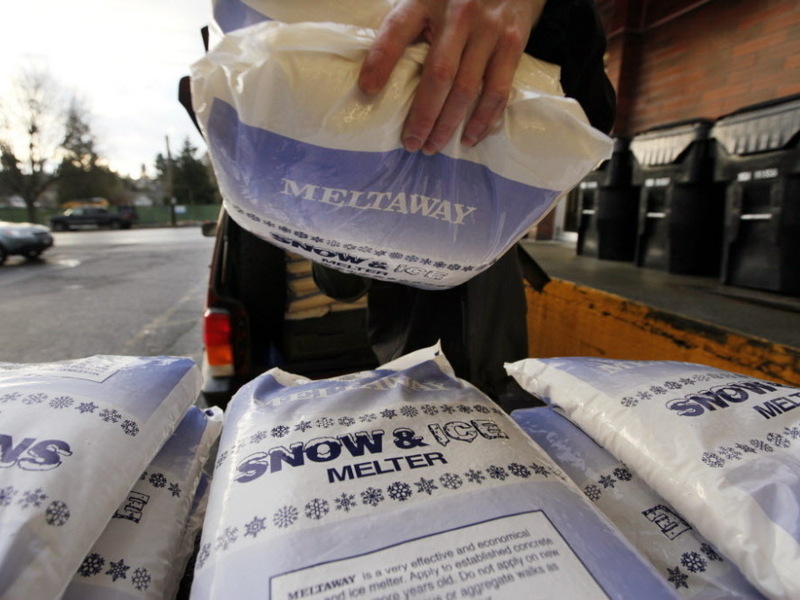 Bags of a deicing product were being stacked outside a hardware store in Seattle on Tuesday, as folks prepared for today's bad weather. While Seattle may not get hit quite as hard as previously thought by a winter storm that's moving across the Northwest, the National Weather Service has issued some ominous sounding updates about how large that storm is turning out to be. "A large portion of the northwestern U.S. has winter storm warnings in place. This region spans as far south as extreme Northern California and as far east as South-Central Montana. Embedded within this expansive area of warnings are winter weather advisories which includes the entire Sierra Nevada mountain chain." As NPR's Howard Berkes reminds us, many parts of the nation have been suffering a snow drought this season, which not only hurts businesses and communities that depend on winter recreation but also means some areas may have a shortage of water come spring. "Ski areas and water agencies consider this to be welcome relief from what was the driest December in the record books for some places," Howard tells our Newscast desk. Though forecasters have scaled back from ominous predictions of up to 10 inches of snow today in Seattle and 4 feet in the Cascade Mountains, it's still going to be "a mess" in much of western Washington State today, The Seattle Times reports. It's now expected the city will get several inches of snow between now and Thursday, with rain mixing in at times, according to the National Weather Service. The Cascades are likely to get a couple feet of snow. Still, "Seattle Public Schools will be closed Wednesday," KING-TV says. And to the south a bit in Olympia, up to 7 inches of snow could fall today. The Olympian newspaper says folks there are being advised to stay home and that "an avalanche warning is in effect for the Olympic and Cascade mountains, where danger is extreme."